The Nikola Tesla Airport (The Belgrade Airport) is located in the Belgrade Municipality of Surčin, about 18 km from the center of Belgrade. The Belgrade Airport was in 2006 renamed The Nikola Tesla Airport, after one of the world’s greatest scientists, who was of Serbian descent. 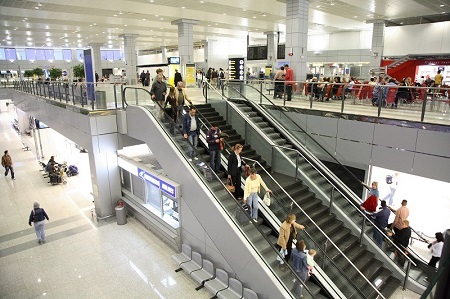 The Belgrade Airport was opened in 1962 in its current location. At the beginning, there was a single runway 3000 m long, a taxiway 3350 m long, an airport traffic control tower and an airport passenger terminal. Later on, a new building was made and the runway made longer, and in 1997 modern equipment installed for plane landing under poor weather conditions. On May 14th, 2006, the renovated Terminal 2 of the Nikola Tesla Airport was opened, so the annual passenger traffic was raised to 5 million. Airport-Transfer-Belgrade organizes transfers from Nikola Tesla Airport in all directions, at your request, at the most affordable and pre-determined prices. Book your transfer with Airport-Transfer-Belgrade, and leave the rest to us. Airpot transfer Belgrade has for a long time successfully operated taxi transfer of passengers from and to the airport in Belgrade. Who has recently been taxiing passengers from and to the airport in Nis. Taxi transport of passengers from door to door across Serbia and all cities. Cajnicka 30, 11090 Belgrade, Serbia. © 2017 AIRPORT TRANSFER BELGRADE. All Rights Reserved.